Hospital librarianship is different from medical librarianship because a hospital librarian is both a medical and a business librarian. There are no subject specialties in hospital librarianship; you are a jack of all trades. Hospital librarians typically work with a broad range of people including medical students, residents, physicians covering a number of medical specialties, nurses, pharmacists, administrators, and sometimes even patients and family members. Not only do you need to be familiar with the typical medical literature databases (PubMed, CINAHL, Medline Plus), you have to be aware of special resources like point-of-care tools, clinical trial databases, evidence-based medicine, and resources concerning the business side of health care, rehabilitation, chaplaincy, psychology/psychiatry… The list goes on and on. Hospital librarians are lucky because our jobs are never dull. We bounce from one user group to another, researching a broad range of topics with many different resources. But that’s also what makes it so hard. You have to know a lot. You need to know the basics of research, database searching, customer service, cataloging, etc., but you also need to know how to interact with different groups of people. How to know the difference between the kinds of literature an administrator wants as opposed to what a physician wants. Further,ou must be able to do this quickly and with authority. If someone is coming to you asking “how do we do xyz to help this patient get better?”, you need to be able to find the answer, have a basic understanding of the answer, and be able to give the user your opinion. Hospital librarianship is a lot like business or law librarianship. Your user isn’t interested in how you got to the answer, what database you used, or how to do it themselves. When someone calls you from the OR because the gastric bypass conversion went wrong or the colon isn’t where it’s supposed to be, a hospital librarian gives the surgeon the answer, plain and simple. There is no time to bombard the user with lots of information and details. A hospital librarian must always be aware that at the end of every search, of every PubMed lesson, of every article ordered, there is a patient, a real person who needs help. Another thing to be aware of is that, unless you are very lucky and work for one the premier research hospitals, hospital librarians work either by themselves (like me) or with a very small support staff. Hospital librarianship is perfect for someone who can’t pick a specialty. Hospital librarians do reference and research obviously, but they also do the collection development, the cataloging, and the marketing. A hospital librarian is very often the director, the interlibrary loan librarian, the page, the electronic resources manager, the copier repair person, and tech support. In one day, a hospital librarian might attend a meeting with the president and chief medical officer of the hospital, join a group of clinicians on patient rounds, spend two hours making copies for various people, repair the fax machine, edit a powerpoint presentation, dust the library, and barter with a vendor over the price of a database. 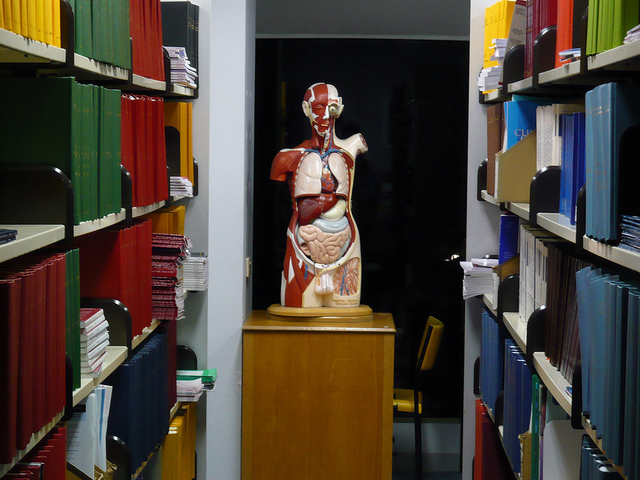 If you are considering a career in health science librarianship, but want something beyond being embedded in the undergraduate nursing program or staffing the desk for the medical school library, take a look at hospital libraries. If you never considered anything related to health science and/or didn’t know that hospitals had libraries, still give hospital librarianship a thought or two. If you like juggling multiple projects at once, enjoy research, are not squeamish, like having autonomy and running the show, and are interested in the future of medicine, being a hospital librarian might be a good fit for you. Elizabeth, better known as Lizy, is a solo hospital librarian living in the Heart of Dixie. In her spare time she enjoys reading romance novels, baking bread, and watching marathons on Netflix. You can check out all her ramblings on cooking, dating, traveling, home-owning, kitty parenting, and occasionally, being a librarian on her blog, Adventures in Life, Love, and Librarianship. She also tweets all the randomness that doesn't make it on her blog as @LibrarianLizy. I have worked in a Hospital Library and I 100% agree with this article. You really are a jack-of-all-trades and you NEVER STOP LEARNING. I learned something new every day! The patrons were interesting and most people think we just deal with doctors....but it takes many different people to run a hospital (E.g. the hospital Chaplain who may have questions or request articles/searches on different religions/cultures/customs and medical care). Add Embase, Scopus and Point-of Care tools like Up-to-date and Dynamed to your list of resources to become familiar with....oh and DocLine which was a fantastic resource! And, you'll get to share some knowledge of those resources when giving library orientation sessions to new employees and information literacy/literature searching and resource sessions to new Residents and students. One thing is the hospital libraries tend to fall under weird organizational umbrellas. Sometimes the Library management will be categorized as "Library Services" but sometimes the Manager/Director in charge of library services is under Administration, Clinical Practice and Education or Human Resources, or outsourced to Library Service Companies. Even though I often worked by myself and it got lonely sometimes, it was really interesting and I often miss working there.